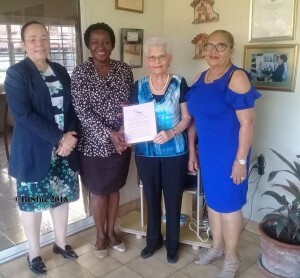 WILLEMSTAD - Part of the organization of the Annual Female Leadership Conference in Curaçao visited last Monday Helga Mensing on the day of the 67th year of the first voting on June 4, 1951 for the representation in the then Island Council of Curaçao. Mrs. Mensing is the one trying to keep the Wednesday Ladies legacy alive. The Wednesday Ladies were the ones whose effort resulted in general voting rights for everyone on the Dutch Caribbean islands. Voting rights were before that only for adult male citizens with a certain level of education. The Wednesday Ladies were part of the political party Partido Nashonal di Pueblo and when Mr. Dr. Moises Frumencio da Costa Gomez, known as Doktor (after whom the local University is named), started his political career he suggested having a committee of women to support his campaign and his political party. The most important task of the committee funded in 1948, had to be teaching people how to be involved in politics by voting and so bring changes in the country. The Wednesday Ladies went door to door to talk with families about politics and let them know about the importance of the right to vote. A special recognition was given during the recently held 15th Annual Female Leadership Conference in Curaçao to the Wednesday Ladies for the work done, the celebration of the 70th years of general voting rights since 1948 and the importance of it in the history of Curaçao. The special recognition was given to Helga Mensing and her committee, for reminding us about this key point in our history. On the picture: from left to right Alba Chatlein, Reyna Joe, Helga Mensing and Marlen Pardo.